and how to end the global epidemic of this lung disease. The theme of World Tuberculosis Day 2019 "It's time" draws attention towards the urgency to act on the commitments made by global leaders to build accountability regarding TB and increase access of prevention and treatment of TB. As part of World World Tuberculosis Day, the World Health Organisation (WHO) has initiated "Find. Treat. All. #EndTB", a joint initiative with Global Fund and Stop TB Partnership under which communities, civil society organisations, governments and health-care providers come together to ensure that no one is left behind and everyone gets equal and fair information about tuberculosis, its causes, symptoms and risk factors. Tuberculosis (TB) is an infectious disease caused by bacteria Mycobacterium tuberculosis (MTB). Tuberculosis affects the lungs and can also infect other parts of the body. Early symptoms of TB include bad cough which lasts for 3 weeks or longer. It causes pain in the chest and one might also end up coughing blood in case of tuberculosis. Why March 24th was chosen as World Tuberculosis Day? 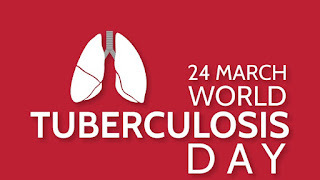 March 24th is observed as World Tuberculosis Day because it was on March 24th 1882, TB bacterium was discovered by Dr Robert Koch. The discovery of TB bacterium marked the first step towards diagnosis and treatment of tuberculosis. Q. When is the World Tuberculosis Day observed every year?